Azure Migrate assesses on-premises workloads for migration to Azure. Use this article to troubleshoot issues when deploying and using Azure Migrate. I am using the OVA that continuously discovers my on-premises environment, but the VMs that are deleted in my on-premises environment are still being shown in the portal. When you delete an Azure Migrate project, it deletes the migration project along with all the groups and assessments. However, if you have attached a Log Analytics workspace to the project, it does not automatically delete the Log Analytics workspace. This is because the same Log Analytics workspace might be used for multiple use cases. If you would like to delete the Log Analytics workspace as well, you need to do it manually. Browse to the Log Analytics workspace attached to the project. a. If you have not deleted the migration project yet, you can find the link to the workspace from the project overview page in the Essentials section. b. If you already deleted the migration project, click Resource Groups in the left pane in Azure portal and go to the Resource Group in which the workspace was created and then browse to it. Follow the instructions in this article to delete the workspace. This issue can happen for users who do not have access to the Azure Active Directory (Azure AD) tenant of the organization. When a user is added to an Azure AD tenant for the first time, he/she receives an email invite to join the tenant. Users need to go to the email and accept the invitation to get successfully added to the tenant. If you are unable to see the email, reach out to a user who already has access to the tenant and ask them to resend the invitation to you using the steps specified here. Once the invitation email is received, you need to open the email and click the link in the email to accept the invitation. Once this is done, you need to sign out of Azure portal and sign-in again, refreshing the browser will not work. You can then try creating the migration project. If you are unable to export the assessment report from the portal, try using the below REST API to get a download URL for the assessment report. a. In an administrator Command Prompt window, run the following command: @powershell -NoProfile -ExecutionPolicy Bypass -Command "iex ((New-Object System.Net.WebClient).DownloadString('https://chocolatey.org/install.ps1'))" && SET "PATH=%PATH%;%ALLUSERSPROFILE%\chocolatey\bin"
This opens the Azure login pop-up where you need to sign in to Azure. Copy the URL from the response and open it in a browser to download the assessment report. Once the report is downloaded, use Excel to browse to the downloaded folder and open the file in Excel to view it. Azure Migrate continuously profiles the on-premises environment to collect performance data of the on-premises VMs. If you have just started the discovery of your environment, you need to wait for at least a day for the performance data collection to be done. If an assessment is created without waiting for one day, the performance metrics will show up as zeroes. After waiting for a day, you can either create a new assessment or update the existing assessment by using the 'Recalculate' option in the assessment report. I specified an Azure geography, while creating a migration project, how do I find out the exact Azure region where the discovered metadata would be stored? You can go to the Essentials section in the Overview page of the project to identify the exact location where the metadata is stored. The location is selected randomly within the geography by Azure Migrate and you cannot modify it. If you want to create a project in a specific region only, you can use the REST APIs to create the migration project and pass the desired region. Deployment of Azure Migrate Collector failed with the error: The provided manifest file is invalid: Invalid OVF manifest entry. Verify if Azure Migrate Collector OVA file is downloaded correctly by checking its hash value. Refer to the article to verify the hash value. If the hash value is not matching, download the OVA file again and retry the deployment. If it still fails and if you are using VMware vSphere Client to deploy the OVF, try deploying it through vSphere Web Client. If it still fails, try using different web browser. If the deployment still fails, contact Azure Migrate support. Unable to select the Azure cloud in the appliance, fails with error "Azure cloud selection failed"
This is a known issue and a fix is available for the issue. Please download the latest upgrade bits for the appliance and update the appliance to apply the fix. *.portal.azure.com Required to check connectivity with the Azure service and validate time synchronization issues. *.oneget.org Required to download the powershell based vCenter PowerCLI module. This can happen if you are using an intercepting proxy to connect to the Internet, and if you have not imported the proxy certificate on to the collector VM. You can import the proxy certificate using the steps detailed here. The collector can't connect to the project using the project ID and key I copied from the portal. On the collector VM, download the MMA. To start the installation, double-click the downloaded file. In setup, on the Welcome page, click Next. On the License Terms page, click I Agree to accept the license. In Destination Folder, keep or modify the default installation folder > Next. 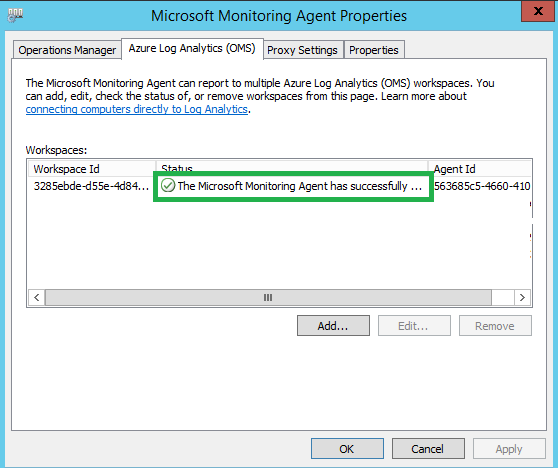 In Agent Setup Options, select Azure Log Analytics > Next. Click Add to add a new Log Analytics workspace. Paste in project ID and key that you copied. Then click Next. Verify that the agent can connect to the project. If it can't, verify the settings. If the agent can connect but the collector can't, contact Support. Open an admin command prompt on the VM. To check the time zone, run w32tm /tz. To synchronize the time, run w32tm /resync. If you are not on the latest version of the collector appliance, upgrade your Collector to the latest version and check if the issue is resolved. a. Close the web browser in the appliance. b. Stop the 'Azure Migrate Collector' service by going to Windows Service Manager (Open 'Run' and type services.msc to open Windows Service Manager). Right click on Azure Migrate Collector Service and click Stop. d. Restart the 'Azure Migrate Collector' service in Windows Service Manager (Open 'Run' and type services.msc to open Windows Service Manager). 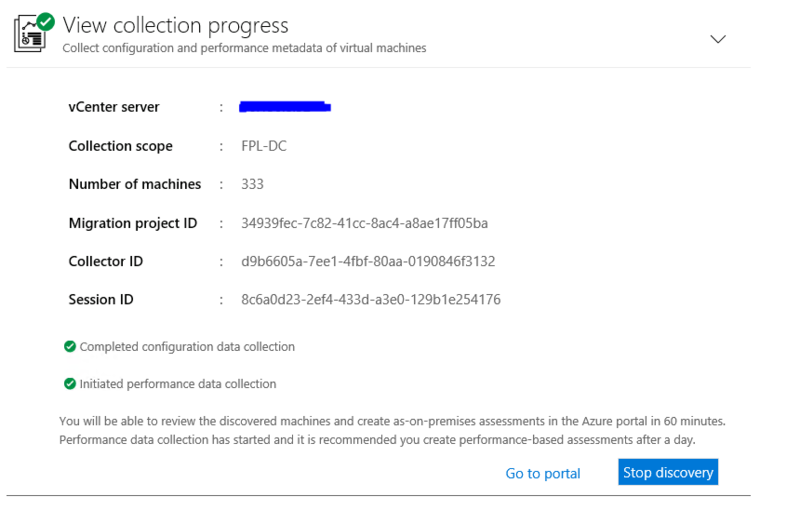 Right click on Azure Migrate Collector Service and click Start. e. Double-click the desktop shortcut 'Run collector' to start the collector application. The collector application should automatically download and install the required version of PowerCLI. a. Clean up all incomplete PowerCLI installation files by following steps #a to #c in step #2 above. d. Copy all modules starting with "VMware" from “C:\Program Files (x86)\WindowsPowerShell\Modules” to the same location on the collector VM. e. Restart the 'Azure Migrate Collector' service in Windows Service Manager (Open 'Run' and type services.msc to open Windows Service Manager). Right click on Azure Migrate Collector Service and click Start. f. Double-click the desktop shortcut 'Run collector' to start the collector application. The collector application should automatically download and install the required version of PowerCLI. Unable to connect to vCenter Server "Servername.com:9443" due to error: There was no endpoint listening at https://Servername.com:9443/sdk that could accept the message. Check if you are running the latest version of the collector appliance, if not, upgrade the appliance to the latest version. If the issue still happens in the latest version, it could be because the collector machine is unable to resolve the vCenter Server name specified or the port specified is wrong. By default, if the port is not specified, collector will try to connect to the port number 443. Try to ping the Servername.com from the collector machine. If step 1 fails, try to connect to the vCenter server over IP address. Identify the correct port number to connect to the vCenter. Finally check if the vCenter server is up and running. I am unable to find the dependency visualization functionality for Azure Government projects. Azure Migrate depends on Service Map for the dependency visualization functionality and since Service Map is currently unavailable in Azure Government, this functionality is not available in Azure Government. I installed the Microsoft Monitoring Agent (MMA) and the dependency agent on my on-premises VMs, but the dependencies are now showing up in the Azure Migrate portal. Ensure that the Status for the workspace is green. If the status is not green, try removing the workspace and adding it again to MMA. For Linux VM, ensure that the installation commands for MMA and dependency agent had succeeded. What are the operating systems supported by MMA? The list of Windows operating systems supported by MMA is here. The list of Linux operating systems supported by MMA is here. What are the operating systems supported by dependency agent? The list of Windows operating systems supported by dependency agent is here. The list of Linux operating systems supported by dependency agent is here. I am unable to visualize dependencies in Azure Migrate for more than one hour duration? Azure Migrate lets you visualize dependencies for up to one hour duration. Although, Azure Migrate allows you to go back to a particular date in the history for up to last one month, the maximum duration for which you can visualize the dependencies is up to 1 hour. For example, you can use the time duration functionality in the dependency map, to view dependencies for yesterday, but can only view it for a one hour window. However, you can use Azure Monitor logs to query the dependency data over a longer duration. I am unable to visualize dependencies for groups with more than 10 VMs? You can visualize dependencies for groups that have up to 10 VMs, if you have a group with more than 10 VMs, we recommend you to split the group in to smaller groups and visualize the dependencies. I installed agents and used the dependency visualization to create groups. Now post failover, the machines show "Install agent" action instead of "View dependencies"
Post planned or unplanned failover, on-premises machines are turned off and equivalent machines are spun up in Azure. These machines acquire a different MAC address. They may acquire a different IP address based on whether the user chose to retain on-premises IP address or not. If both MAC and IP addresses differ, Azure Migrate does not associate the on-premises machines with any Service Map dependency data and asks user to install agents instead of viewing dependencies. Post test failover, the on-premises machines remain turned on as expected. Equivalent machines spun up in Azure acquire different MAC address and may acquire different IP address. Unless the user blocks outgoing Azure Monitor logs traffic from these machines, Azure Migrate does not associate the on-premises machines with any Service Map dependency data and asks user to install agents instead of viewing dependencies. Unsupported boot type Azure does not support VMs with EFI boot type. It is recommended to convert the boot type to BIOS before you run a migration. You can use Azure Site Recovery to do the migration of such VMs as it will convert the boot type of the VM to BIOS during the migration. Conditionally supported Windows OS The OS has passed its end of support date and needs a Custom Support Agreement (CSA) for support in Azure, consider upgrading the OS before migrating to Azure. Unsupported Windows OS Azure supports only selected Windows OS versions, consider upgrading the OS of the machine before migrating to Azure. Conditionally endorsed Linux OS Azure endorses only selected Linux OS versions, consider upgrading the OS of the machine before migrating to Azure. Unknown operating system The operating system of the VM was specified as 'Other' in vCenter Server, due to which Azure Migrate cannot identify the Azure readiness of the VM. Ensure that the OS running inside the machine is supported by Azure before you migrate the machine. Unsupported OS bitness VMs with 32-bit OS may boot in Azure, but it is recommended to upgrade the OS of the VM from 32-bit to 64-bit before migrating to Azure. Requires Visual Studio subscription. The machines has a Windows client OS running inside it which is supported only in Visual Studio subscription. VM not found for the required storage performance. The storage performance (IOPS/throughput) required for the machine exceeds Azure VM support. Reduce storage requirements for the machine before migration. VM not found for the required network performance. The network performance (in/out) required for the machine exceeds Azure VM support. Reduce the networking requirements for the machine. VM not found in the specified location. Use a different target location before migration. One or more unsuitable disks. One or more disks attached to the VM do not meet the Azure requirements. For each disk attached to the VM, ensure that the size of the disk is < 4 TB, if not, shrink the disk size before migrating to Azure. Ensure that the performance (IOPS/throughput) needed by each disk is supported by Azure managed virtual machine disks. One or more unsuitable network adapters. Remove unused network adapters from the machine before migration. Disk count exceeds limit Remove unused disks from the machine before migration. Disk size exceeds limit Azure supports disks with up to size 4 TB. Shrink disks to less than 4 TB before migration. Disk unavailable in the specified location Make sure the disk is in your target location before you migrate. Disk unavailable for the specified redundancy The disk should use the redundancy storage type defined in the assessment settings (LRS by default). Could not determine disk suitability due to an internal error Try creating a new assessment for the group. VM with required cores and memory not found Azure couldn't fine a suitable VM type. Reduce the memory and number of cores of the on-premises machine before you migrate. Could not determine VM suitability due to an internal error. Try creating a new assessment for the group. Could not determine suitability for one or more disks due to an internal error. Try creating a new assessment for the group. Could not determine suitability for one or more network adapters due to an internal error. Try creating a new assessment for the group. How do I collect logs on the collector VM? On the collector VM, open a PowerShell command window. Run Get-EventLog -LogName Application | export-csv eventlog.csv. How do I collect portal network traffic logs? Open the browser and navigate and log in to the portal. Press F12 to start the Developer Tools. If needed, clear the setting Clear entries on navigation. In Microsoft Edge/IE, recording should start automatically. If it doesn't, click the green play button. Try to reproduce the error. In Chrome, right-click and click Save as HAR with content. This zips and exports the logs as a .har file. In Microsoft Edge/IE, click the Export captured traffic icon. This zips and exports the log. In Chrome, right-click anywhere in the console log. Select Save as, to export and zip the log. In Microsoft Edge/IE, right-click on the errors and select Copy all. 601 CollectorExpired Collector has expired. Collector Expired. Please download a new version of collector and retry. 751 UnableToConnectToServer Unable to connect to vCenter Server '%Name;' due to error: %ErrorMessage; Check the error message for more details. Resolve the issue and try again. 752 InvalidvCenterEndpoint The server '%Name;' is not a vCenter Server. Provide vCenter Server details. Retry the operation with correct vCenter Server details. 753 InvalidLoginCredentials Unable to connect to the vCenter Server '%Name;' due to error: %ErrorMessage; Connection to the vCenter Server failed due to invalid login credentials. Ensure that the login credentials provided are correct. 754 NoPerfDataAvailable Performance data not available. Check Statistics Level in vCenter Server. It should be set to 3 for performance data to be available. Change Statistics Level to 3 (for 5 minutes, 30 minutes, and 2 hours duration) and try after waiting at least for a day. 756 NullInstanceUUID Encountered a machine with null InstanceUUID vCenter Server may have an inappropriate object. Resolve the issue and try again. 758 GetPerfDataTimeout VCenter request timed out. Message %Message; vCenter Server credentials are incorrect Check vCenter Server credentials and ensure that vCenter Server is reachable. Retry the operation. If the issue persists, contact support. 759 VmwareDllNotFound VMWare.Vim DLL not found. PowerCLI is not installed properly. Please check if PowerCLI is installed properly. Retry the operation. If the issue persists, contact support. 800 ServiceError Azure Migrate Collector service is not running. Azure Migrate Collector service is not running. Use services.msc to start the service and retry the operation. 801 PowerCLIError VMware PowerCLI installation failed. VMware PowerCLI installation failed. Retry the operation. If the issue persists, install it manually and retry the operation. 802 TimeSyncError Time is not in sync with the internet time server. Time is not in sync with the internet time server. Ensure that the time on the machine is accurately set for the machine's time zone and retry the operation. 702 OMSInvalidProjectKey Invalid project key specified. Invalid project key specified. Retry the operation with correct project key. 703 OMSHttpRequestException Error while sending request. Message %Message; Check project ID and key and ensure that endpoint is reachable. Retry the operation. If the issue persists, contact Microsoft Support. 704 OMSHttpRequestTimeoutException HTTP request timed out. Message %Message; Check project ID and key and ensure that endpoint is reachable. Retry the operation. If the issue persists, contact Microsoft Support.